In the movie Steel Magnolias, the character Clairee declares that, "The only thing that separates us from the animals is our ability to accessorize." Well -- she's right! One room that can really benefit from a little freshening up is the bathroom. By adding accents and accessories, we can make our bathrooms more inviting. 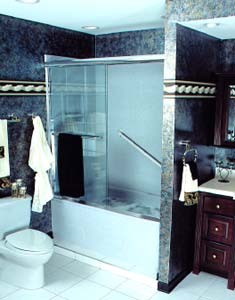 Here are some cost effective solutions for accessorizing and revitalizing your bathroom. Begin by picking a design theme or color scheme. (See tip number five-and-a-half for further advice.) This narrows the focus and will help you in the decision- making process. If the color of your bathroom is monotone, where everything is white -- walls, fixtures and counters -- changing the towels can bring an entirely new look to the room. The selection of towels to choose from is almost endless. There are vibrant, solid colors for a bold accent. Printed or embroidered towels are available in virtually any theme or style from traditional to tropical. Consider purchasing a set of towels for seasonal use. You do not have to purchase all new towels, just enough that to create a visual difference between summer and winter. Two each of the bath towels, hand towels and washcloths may be enough. For the year-round towels, select neutral tones or solids that coordinate with your decor. For the seasonal accent towels, select lighter, brighter colors and patterns for summer and darker, richer tones and patterns for winter. Shower curtains are one of the most dramatic accessories in the bathroom, and can change the room's look instantly. As with towels, the colors and patterns of curtains available seem virtually endless. To create a warmer, more refined look, use fabric shower curtains with a printed or embroidered pattern. Vinyl shower curtains tend to be less expensive. They provide a more casual and sometimes whimsical tone to the bathroom like hula girls and an underwater scene with brightly colored tropical fish. A bathroom "ensemble" typically includes a waste can, boutique tissue holder, tumbler, toothbrush holder, soap dish, lotion/soap dispenser and jar for incidental items. You do not have to purchase the entire set to perk up a tired bathroom. If you have limited space, consider just the waste can and tumbler. When selecting a style, make sure it fits with the overall look of the room. There are a number of styles to choose from -- modern, traditional, whimsical and formal, as well as styles appropriate for a children's bathroom. Finishes include metallic and materials that mimic ceramic with patterns that range from floral to exotic. Consider using colored and textured non slip appliques for the bathroom tub. Your bathroom will be safer and your more beautiful if you are careful to choose a coordinating style to match the rest of the room. Set the tone for the bathroom by treating it like any other room in the house. Hang art on the walls, or install a small shelf for displaying knickknacks or other treasured items. Mirrors are a welcome addition in small bathrooms. A collection of small mirrors finished in decorative frames adds glamour to your bathroom. They also reflect light to make the space appear brighter and larger. Use an odd number of small mirrors -- one, three, five -- in combination with other artwork. Before hammering nails in the wall, place all the items on the floor until you have the arrangement you like. For the do-it-yourselfer, purchase decorative picture frames and replace the glass with mirror. And remember -- mirrors and pictures should be hung at eye level. For those living in apartments, accessorizing a bathroom can be challenging, especially if you do not like the existing colors. Don't work against what you've got, work with it. The same can be said for those with a bathroom they don't like but simply can not afford to remodel. What if you prefer bright accent colors like candy-apple red, but have a bathroom filled with earth tones? You may have to compromise, but there is a way to work with the color scheme that is already there. Your favorite color probably won't work, so try a red with some earthiness to it, like terracotta or poppy. Find a color that pleases you that does not fight the colors already there. Hang a piece of artwork that includes both the colors you already have (but are not crazy about) but also includes the accent colors you like.